Taking place in Hurleyville, NY, 1Future Forum is the inaugural gathering of thought leaders and cultural programming to celebrate innovation and disruption.The event is an opportunity to discover regional and global artists, to engage social and environmental issues important to local residents and around the globe. The forum will build inclusive relationships and sustainable development across race, gender and disability lines. 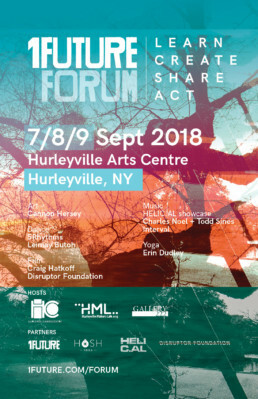 This event is a moon-shot pilot to create a “Davos of the Tri-state area” in Hurleyville, one of the poorest counties in New York State, just 90 minutes outside NYC. Location: Hurleyville, NY in the foothills of the Catskills. A hamlet in transformation to be a model for small town regenerative economies in the 21st century. Free, family-friendly event with music, morning yoga, local vendors, lawn games, and art projects at the original location of the Woodstock Festival (10 minutes from Hurleyville). Late lunch of farm-to-table cuisine will be catered by the Main Street Market in Livingston Manor. Introduction by Mark Mcnamara, director of the Hurleyville Makers Lab and a conversation on the jobs of the 21st century in small town America. A creative agency and online platform that produces high-quality media, art and events to drive social change. By connecting artists and innovators, activists and audiences with stories of historical and global impact, 1Future has has a four-point engagement model: Learn, Create, Share and Act. A local event & arts centre where multi-cultural, intergenerational, and all abilities are represented through storytelling, film, dance, theater and music. A non-profit membership organization providing an affordable and collaborative workspace for makers, tinkerers and DIY’ers. Hosh Yoga and Hosh Kids are NY-based wellness organizations that deliver cost-effective and fairly-priced yoga and enrichment programs for thousands of children, adults, and seniors throughout the NYC community. At The Center, people with disabilities work hard to find a way forward as they shape lives of meaning.The Center’s Hurleyville Project is a collaboration of area residents, public and private partners to create a model of healthy living for people, the land and the region’s economy.